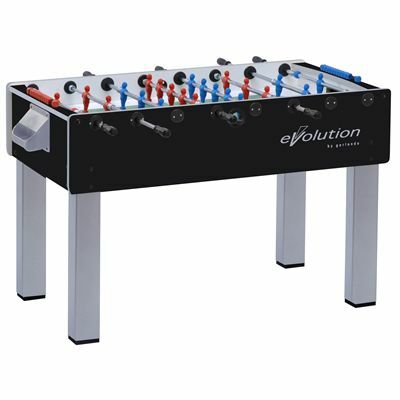 The Garlando F-200 Evolution Family Football Table with Telescopic Rods is one of a series of three football tables by Garlando that have a tasteful aluminium and black combination of finish producing a hi-tech and fascinating effect. High quality, great price. Cabinet: Durable 20mm thick MDF cabinet with melamine coating. Legs: 9 x 9cm square MDF legs (15mm thick) coated with melamine in silver effect. Rods: 2mm thick high stress resistance steel going-through bars coated with anti-rust chrome plating. 2mm thick telescopic security bars to ensure the greatest safety. 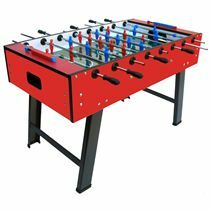 Roller Bearings: Steel roller bearings to significantly improve the game speed, while reducing the stress for the players' wrists. Playing Field: Plastic laminate with sloped corners and green background with white lines to look like a football ground. Goalkeeper: Fully rotating (360 degrees) . Goal: Easy and immediate ball retrieval through a basket in grey colour behind each goal. Balls: 10 standard white balls included. for submitting product review about Garlando F-200 Evolution Indoor Football Table.